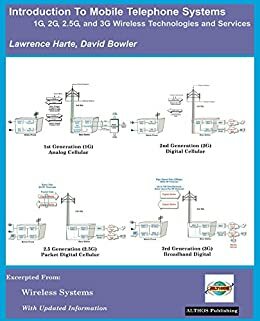 This book explains the different types of mobile telephone technologies and systems from 1st generation analog to 3rd generation digital broadband. It describes the basics of how they operate, the different types of wireless voice, data and information services, key commercial systems, and typical revenues/costs of these services. <br /><br />Mobile telephone technologies, systems, and services have dramatically changed over the past 2 years. New technology capabilities and limited restrictions (deregulation) are allowing existing systems to offer new services. Many of these new services compete with other types of wireless systems that have not experienced significant competition. <br /><br />While new competition has provided lower cost services for consumers, it means a rapidly changing marketplace for the wireless industry. Some of these changes include the increase in mobile telephone customers from 300 million to 1.3 billion customers within 5 years and the shift of focus from adding new voice customers to providing advanced services such as data transfer, web browsing, and software downloads. <br /><br />The types of services that mobile telephone systems can offer vary depending on the technologies, devices, and the services selected by customers. This book discusses the different types of systems including 1st, 2nd, 2.5, and third generation wireless (3G) and the types of services they can offer.